I've never been a fan of vegetables. But, that changed the day I made this dish. It's the type of dish you want to eat outside on the patio with friends and the sun shining down on your face. It leaves you full without being too heavy. It's essentially just fried vegetables, but the salad on top with the roasted tomatoes and balsamic dijon mustard dressing take it to another level. Cut the tomatoes in half and place in a large bowl. Chop the garlic and add to the bowl of tomatoes. Mix in the salt, pepper, and olive oil. Toss together and spread evenly onto a foil lined baking sheet. Cook for 20 minutes. In a saucepan, bring the balsamic vinegar to a boil. Reduce for 3 minutes. Remove from heat and place it in a separate bowl. Whisk in the dijon mustard and set aside. Place the panko, salt, and pepper in a deep dish. Whisk the egg in a separate deep dish. Cut the zucchini and squash lengthwise into 1/4 inch pieces. Dip each piece into the egg. Be sure to let the excess drip off. 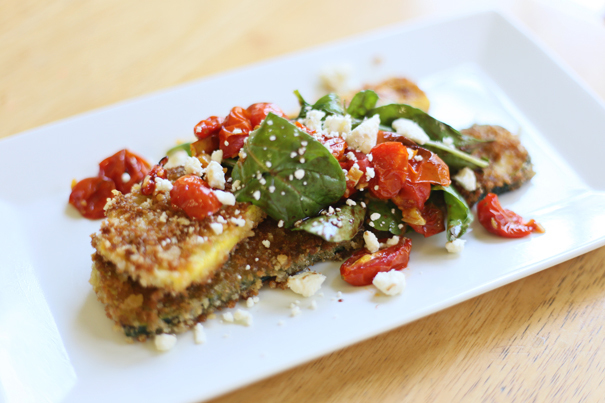 Place the zucchini or squash into the panko crumbs. 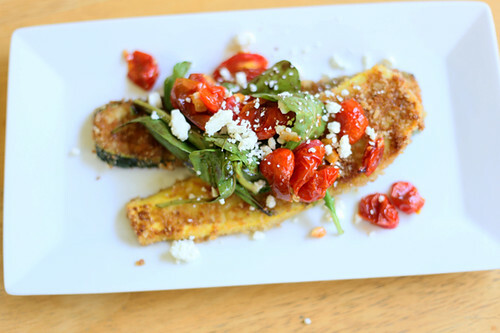 Place the zucchini and squash into the frying pan and cook for 3 minutes on each side. Toss the arugula, tomatoes, and feta cheese together with the balsamic vinegar dijon dressing. 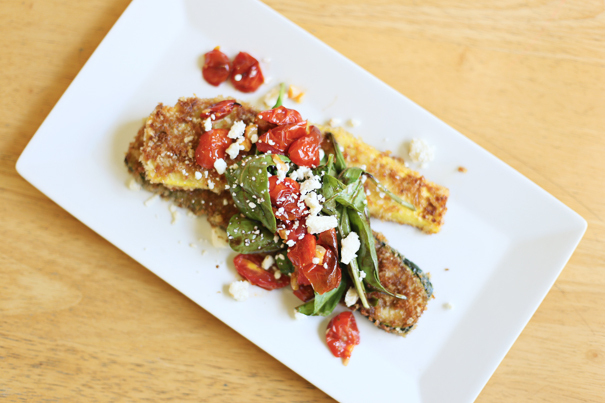 Place on top of the fried zucchini and squash and sprinkle with extra feta cheese. Yum yum yum! This is making my mouth water just by looking at it!